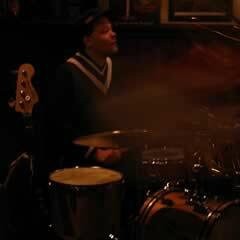 There is a jam session for amateur jazz players every other Tuesday at the Bebop jazz café in Delft. It's free of charge and open to everyone who likes to play jazz standards. If you're living or working in Holland and don't speak Dutch, don't worry, music is an international language, feel free to come and have a listen, or join in. The standard of playing is generally quite good, so why not drop in and see if it's your cup of tea? For dates see the calendar (agenda). The house band plays a half-hour set starting at 8.30 pm and the session starts at 9.00 pm. When you arrive, have a word with the session leader to let him know that you would like to play and what instrument. After the house band's set we play four half-hour sets. We have a basic repertoire, mainly Real Book tunes which most of the house band members are familiar with. For the less experienced session players among you, and those who would like to practise the tunes first, here is a list. To subscribe to the mailing list and receive notification of every session send an e-mail to info@dajaja.nl. Are you looking for a rehearsal room? Check out MusicLab.